The amount of alcohol in a person's body is measured by the weight of the alcohol in a certain volume of blood. 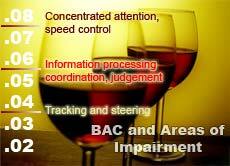 This is called the blood alcohol concentration or BAC. BAC measurements provide an objective way to identify levels of impairment, because alcohol concentration in the body is directly related to impairment. The BAC measurement is expressed as grams per deciliter (g/dl) of blood, and in most states a person is considered legally intoxicated if his or her BAC is .08 g/dl or greater. Breath testing is the primary method used by law enforcement agencies for measuring BACs. At the time of the first face-to-face contact with a suspected impaired driver, techniques for detecting whether alcohol is present or absent can be performed easily by law enforcement officers during roadside stops using hand-held passive alcohol sensors. Use of these devices is non-invasive and can even be performed while the person is still in his or her vehicle. With each drink consumed, a person's blood alcohol concentration increases. Although outward appearances vary, virtually all drivers are substantially impaired at .08 BAC . Laboratory and on-road research shows that the vast majority of drivers, even experienced drivers, are significantly impaired at .08 with regard to critical driving tasks such as braking, steering, lane changing, judgment and divided attention. Decrements in performance for drivers at .08 BAC are on the order of 40-60% worse than when they are at .00 BAC. Research findings suggest that the most crucial aspect of impairment is the reduction in the ability to handle several tasks at once. This skill is precisely what driving a motor vehicle requires. The risk of being in a motor vehicle crash also increases as the BAC level rises. The risk of being in a crash rises gradually with each BAC level, but then rises very rapidly after a driver reaches or exceeds .08 BAC compared to drivers with no alcohol in their system. Research by the Insurance Institute for Highway Safety indicates that the relative risk of being killed in a single vehicle crash for drivers at BACs between .05 and .09 is 11 times that of drivers with no alcohol in their system.